It’s easy to get confused in a world where social media properties appear and vanish daily. Fortunately, Microsoft Outlook 2019 can help you keep current by neatly tracking your social media subscriptions, along with your email, contacts, appointments, and everything else you need to keep organized, as shown. You can use Outlook to read RSS feeds you follow. The technique that lets you use Outlook to keep track of all this changing information is called RSS, which stands for Really Simple Syndication or Rich Site Summary. 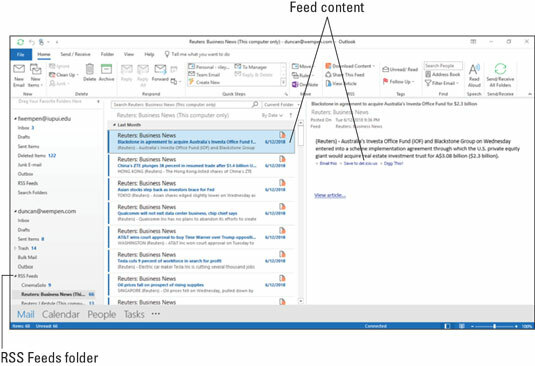 Outlook has a separate folder for receiving RSS feeds so you can organize the information in a way you find useful. You don’t really need to know how RSS works, but it’s good to know it’s available when it’s useful to you. RSS information is delivered in something called a feed. As appetizing as that sounds, it’s not very filling. In fact, it’s not even edible. A feed is just a mechanism for updating information as it changes. Blogs and podcasts usually offer RSS feeds that allow you to keep track of new entries or episodes. RSS technology lets you subscribe to information that changes frequently so it automatically updates itself. For example, most news organizations, such as The Wall Street Journal and Reuters, offer RSS feeds of their news stories. When you want to see the latest headlines, you don’t need to open a website. Just check the RSS Feeds folder to look for any headlines that interest you. Every time a new story is posted to the respective website, the story also shows up in the RSS feed. Click the File tab in Outlook. Choose Options. The Outlook Options dialog box opens. Select the Synchronize RSS Feeds to the Common Feed List (CFL) in the Windows check box. It’s in the RSS section. Blogs, podcasts, and news organizations are three important segments of the social media world. You can ignore any of them if you want, but chances are that you’re reading or viewing many of them already. As you can with news services and podcasts, you can use Outlook to subscribe to your favorite blogs so you can stay up to date with the newest entries without having to surf all over the Internet to find out what’s new. Most radio stations — especially news, talk, and information stations, such as NPR — offer digital, downloadable editions of the programs they air. Those editions are called podcasts; you’ve probably heard that term mentioned frequently by your favorite radio personalities. Podcasts are typically regular, recurring programs. You can download podcasts one at a time or you can set up a subscription so you receive them automatically. The term podcast is misleading. Lots of people think they can only listen to podcasts with a digital music player. Others don’t listen to as many podcasts as they might enjoy because podcasts are a little bit cumbersome to find, download, and play. While podcasts were originally designed to be played on portable devices, many people listen to podcasts on their computers. If your computer can run Outlook, it can also play podcasts. Outlook enables you to get any podcasts to which you’ve subscribed and organize them with the same tools you use for organizing email. A few years ago, everyone talked about blogs as if they were some big, new, whiz-bang technology, but they’re really not. If you surf the Internet for news and information like everybody else, you may be reading blogs without even knowing it. Most major news services offer some kind of blog section where reporters and commentators post breaking news and current observations. A blog is really nothing more than a webpage that allows frequent updates and organizes the updates so that the newest ones appear first. Bloggers have become the preferred source of news for many people today. They can also be a monumental waste of time if you spend your whole day surfing from one blog to the next. Outlook can make that process more efficient for you by giving you one place to read all your blogs and keep up with the latest gossip. Oh — and with important news, too! You can use Outlook to read your favorite blogs, as well as more official-looking RSS feeds like news services.